This Tissue Paper Technique will show you how to recycle the left over stuff we all collect! What do you do with the paper that comes around a new pair of shoes? Or that comes with some new clothes you have just bought? Do you throw it a way? 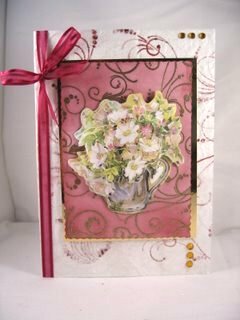 Or do you put it to good use in your cardmaking? 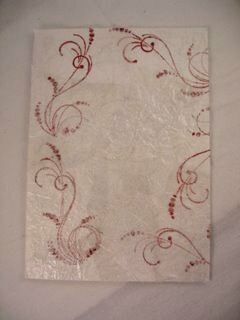 If you are frugal you will put it to good use, and this Tissue Paper Technique is one way to use it up. It doesn't matter what colour it is, it can all be used up. And it doesn't matter if it is all creased... you're just going to crease it even more! 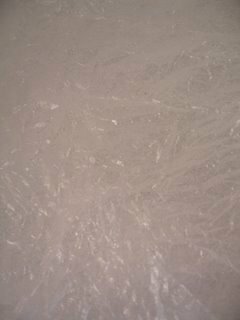 My piece was from some shoes and it is just white creased paper. Crumple it up some more and then open it out. ...and then tore it into squares to fit the front of my card base. With a clear wet glue add these pieces randomly, to the front of the card. ...and then trim around the edges to give a neat and tidy finish. Trimming from the back gives a better result. With a stamp of your choice decorate the edges of the paper, and overlap them as you go along. 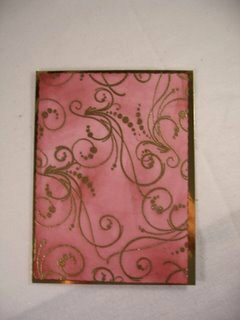 I used a "Flourish" Stamp and some distress inks. 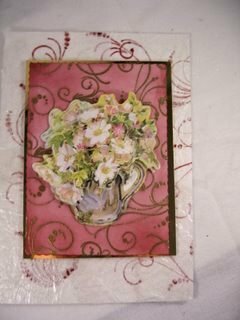 The focal point of the card was made using the Resist Stamping Technique. It was then Matted and Layered onto some Gold Mirror Card. 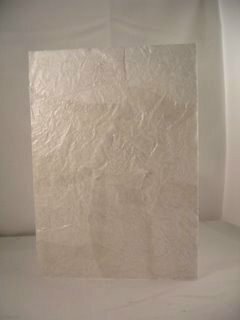 Add this panel with some foam pads, to raise it up and add depth to your creation. And the decoupaged bouquet in the jug, was a lucky buy from a car boot sale. I have added glitter to parts of the image and a used foam pads again. 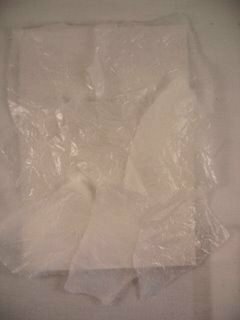 The Tissue Paper Technique is an excellent way to use up what you might otherwise have just thrown away. Return from Tissue Paper Technique to Homepage.